The primary objective of this study was to report on the occurrence of mental health difficulties for a large national sample of Australian fathers of children aged 0–5 years (n = 3,471). Secondary objectives were to compare fathers’ mental health against normative data for the general male adult population, and to examine the course of mental health problems for fathers across the early childhood period. Secondary analysis of data from the infant cohort of the Longitudinal Study of Australian Children at three waves when children were 0–12 months, 2–3 and 4–5 years. Comparative data on the prevalence of psychological distress in the Australian adult male population sourced from the National Survey of Mental Health and Wellbeing. Approximately nine per cent of fathers reported symptomatic or clinical psychological distress at each wave, as measured by the Kessler-6. Approximately 30 % reporting distress at wave 1 continued to report distress at a similar or worse level across waves 2 and 3. Fathers not living with their children also had high rates of distress (14 % at wave 1 and 10 % at wave 2). 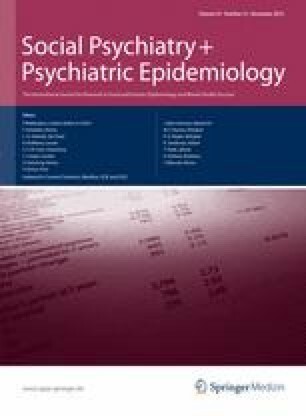 Finally, fathers in the present study had 1.38 increased odds (95 % CI 1.12–1.69) for psychological distress compared with the Australian adult male population. Fathers are at risk of experiencing postnatal mental health difficulties, which may persist across the early childhood period for some fathers. The results suggest routine assessment of fathers’ wellbeing should be undertaken in the postnatal period with mental health interventions and support provided across the early childhood period. This paper used data from the Longitudinal Study of Australian Children. The study was conducted in partnership between the Department of Families, Housing, Community Services and Indigenous Affairs (FaHCSIA), the Australian Institute of Family Studies (AIFS) and the Australian Bureau of Statistics (ABS). The findings reported in this paper are those of the authors and should not be attributed to FaHCSIA, AIFS or the ABS. The National Survey of Mental Health and Wellbeing was conducted by the ABS, and funded by the Australian Government Department of Health and Ageing (DoHA).The findings reported in this paper are those of the authors and should not be attributed the ABS or DOHA. All MCRI staff are supported by the Victorian Government’s Operational Infrastructure Program. PRC staff were supported by funding from the Victorian Government Department of Education and Early Childhood Development. Professor Nicholson, Dr Mensah, and Mr Christensen were supported by the Australian National Health and Medical Research Council (Career Development Award 390136, Population Health Capacity Building Grant 436914, and NHMRC Program Grant 572742 respectively).